Award Nominations: The Umpire Ejection Fantasy League prepares to distribute its Postseason Awards to eligible umpires* who, during the past season, have demonstrated significant performances to fit the terms of one of these awards (UEFL Rule 4-4). 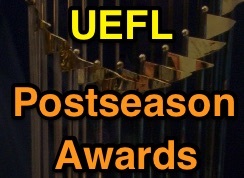 Click here for the complete history and list of UEFL Postseason Awards recipients. Please take your time in consideration of an umpire for as many or as few awards as you prefer; Ballots will be accepted until 11:59 PM PT on Sunday, November 6; Awards distribution will begin Monday, November 7. To cast your ballot, complete the following voting form. Points scale for post season awards: a. (+5); b. (+3); c. (+2); d. (+2); e. (+1); f. (+1); g. (+1); h. (-3). *Eligible umpires are listed on the ballot for each applicable category. For instance, only umpires on the full-time staff roster are eligible for Awards a-c, e, f and h. You may also write in an umpire if such umpire does not appear by commenting on this post. Make sure you use the phrase "Write In" so it is counted. a. Umpire of the Year: This Umpire has been the best MLB Umpire the past year, bar none. This Umpire has been more dedicated, professional, and positive than all others. This award will be given to one umpire. b. Noteworthy Umpire of the Year: This Umpire has been dedicated, professional, and has worked hard. Perhaps a rising star, the Noteworthy Umpire of the Year is an umpire to keep an eye on, for an expectation of great things down the line. This award will be given to one or two umpires. c. Honorable Umpire of the Year: This Umpire has been the most honorable Umpire during the past year. Perhaps through Community Service, or through struggling with and overcoming his own difficulties, this Umpire has been the most personally admirable of all. This award may or may not be given to either one or two umpires. d. Fill-In Umpire of the Year: This Umpire has been the best AAA Call-Up Umpire the past year, bar none. This Umpire has been the most dedicated, professional, and positive AAA/Non-MLB Full Time Umpire of all non-MLB Full Time Umpires. This award may or may not be given to a maximum of one umpire. e. Most Improved Umpire of the Year: This Umpire has improved his overall performance from the previous season more noticeably than any other Umpire. Generally, this umpire has developed into a solid arbiter within the past year. This award may or may not be given to a maximum of one umpire. f. Crew Chief of the Year: This Umpire has been the best MLB Umpire Crew Chief, the past year, bar none. This Umpire has led his crew(s) better than all others. This award will be given to one umpire. g. Best Ejection of the Year: In the form of "Ejection 123: Umpire (1)," this award recognizes the best ejection(s) of the year. Nominated and selected due to form, mechanics, entertainment value, reason for ejection, or overall quality, the Best Ejection of the Year is awarded to one or two umpires for one or two specific ejections. The award may be given to one umpire for two separate ejections, in which case, he receives one point for each ejection. h. Worst Umpire of the Year: This Umpire has shown a continual regression in ability, and might have had a regrettable incident(s) occur in-season. The Worst Umpire of the Year is unprofessional and does a disservice to Umpires and the game. This award may or may not be given to a maximum of one umpire. The ballot is available below. Click "read more" to view and vote.